Due to the expected response to these auditions, we have decided to split them on the day, ?into 2 groups. Because of this the times for the auditions have changed slightly. They will now be held firstly at 12.30pm for the boys and then 1.30pm- 2.30pm for all adults. The adults will have to sing a song to show off their vocal range. Boys will be taught the music. We are holding a second round of auditions – on Sunday 23rd November ?at the Playhouse. These auditions are for all male and boy roles including, Fagin, Mr Bumble, ?Oliver, The Artful Dodger and more. Please register your interest by e-mailing ?admin@altrinchamgarrick.co.uk? ?and, if required, we can send you more information about this audition. 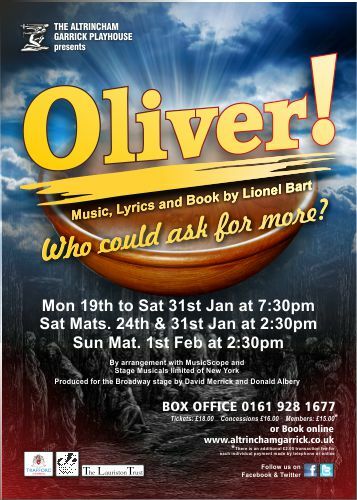 Please ?put ‘OLIVER?AUDITIONS‘ ?in the subject title of any e-mail, to make sure it reaches the correct department. All parts are currently open to Garrick members and non members. If successful you will have to join the society, pay your subs and become a member. If you think you have what it takes, don?t delay and apply now. The auditions will be relaxed and fun. We want to get the best out of you!